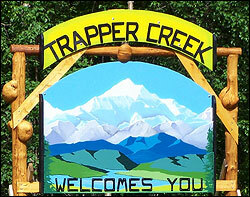 Trapper Creek Community Center. Milepost 115.2 George Parks Highway. Turn left on E. TC Park Circle. I. Meeting called to order 6:30 pm. Posted within fourteen days of said meeting. III. Board Members in Attendance: Ritenburgh, Morrill and Glenka. Board Members Absent: Grelson and Miller. Guest: Borough Assembly Representative Tam Boeve. IV. Reading and approval of November and December 2018 minutes. Approved as written. · Discussion of potential options regarding a fire department. · Ordinance 18-093 Timber Transport Permit modifications to be reconsidered on the Assembly agenda February 5th. · There is an Assembly work session at Turkey Red, a restaurant on Main St. in Palmer this Saturday, January 19th 10 am. · Willow State Winter Carnival is January 25th – February 3rd, 2019. · Borough Board Vacancy: Trapper Creek RSA #30 (Road Service Agreement) is a 3-member board with 2 vacancies. Contact the Borough Clerk’s Office 861-8683. Correspondence/Current Mail: Mail was previously emailed to the membership and a list of that mail was provided. Village Safe Water Program (VSW): Matsu Borough Public Notice MSB007340 comment period ends tomorrow, Friday, January 18th. Council comment in support of project. Next step is land conveyance to TCCSA and then Assembly approval. In the meantime, the TCCSA has scheduled an open meeting to discuss business and management planning on January 24th, 11 am, at the park. 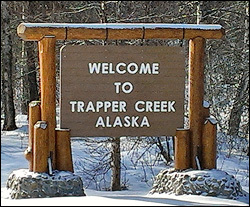 FY2019 Neighborhood Watch Program Mat Su Borough Grant: Crime Stopper signs have been posted at several locations in the Trapper Creek area. Motion to donate $120 to their non-profit entity made by Rittenburgh and seconded by Morrill. Passed unanimously. At the February council meeting a date will be determined to hold a public meeting to involve the community in neighborhood watch. Spruce Beetle Strategy Meeting: Information and contacts were acquired as a result of the November 29th teleconference meeting. Information about the Forest Stewardship Program which informs of the funding assistance to potentially remove dead spruce trees, reduce fire danger, and restore the forest has been provided via email to the TCCC membership. D. Trapper Creek Fire List update: This list is still on the bulletin board at the post office acquiring updates. The Trapper Creek Community Fire List (the list is a telephone “tree” of Trapper Creek residents’ name and phone numbers in case there is a fire in our area), is being updated now, at the Trapper Creek Post Office. Last update to this list was in May 2012. Mat-Su Community Councils for Public Safety (MSCCPS) update: Captain April made a presentation on the activities of the Troopers during the past year. This included statistics on available personnel and responses made by Detachment B. Community Assistance Program (CAP): Reports to Borough for the FY2016 & FY2017 grants will be filed for the period 07/01/2018 to 12/21/2018 in a timely manner. FY2018 CAP Grant: The setting of dates for Project Proposals was tabled until February council meeting. On December 28, 2018 a meeting was held with Dave Ritenburgh, Paula Glenka, Janet Grelson and Tam Boeve to discuss the Trapper Creek Fire Service Area. Information discussed was presented tonight as part of the Borough Assembly report. XIII. Date of next meeting scheduled for Thursday, February 21, 2019, 6:30 pm. XIV. Meeting adjourned at 8:30pm. This entry was posted in Meeting Minutes on January 25, 2019 by Chris Boone.